Optimizing the nav station for night watches means different things for different people. The best solution is a function of where you will be navigating, the amount of traffic likely to be encountered, and–most important–the eyesight of the watch-standers. A few years ago we would not have even considered this last element, but as the two of us have “matured“ our night vision has degraded. This became very apparent last fall when we were caught at night on the Intracoastal Waterway with no place to tie up, no moon to light our way, with a moderate rain falling. 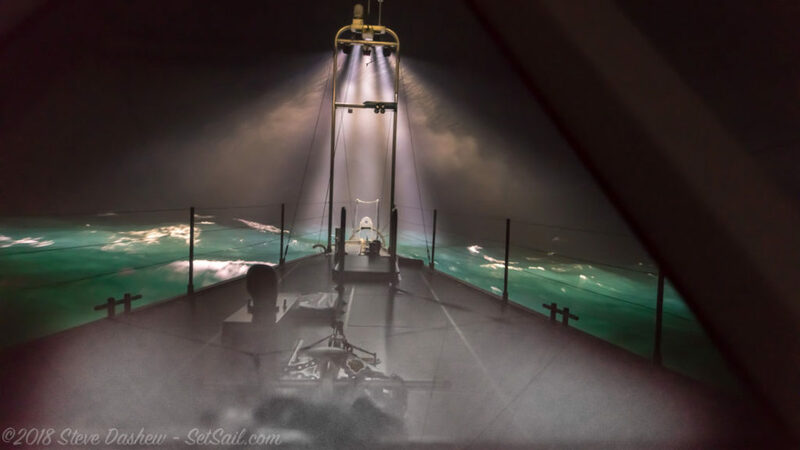 Although we have two radars, several chart plotters and sonar, our eyesight penetrating the dark ahead is the most critical tool in these conditions. The important nature of several small details has now become more apparent. This first set of photos represents what we have historically felt was a good layout. The big display on the right is vertical with an overhanging lip to keep light from lighting the headliner. The secondary monitor on the desk to port can be covered in difficult situations. And we are reasonably close to the windows. The key element in this setup is keeping reflected light off the inside of the windows. We have found that even a single 4″/100 mm instrument face will put enough light onto a window to disrupt our night vision. Having the forward windows angled forward at the top reduces the amount of reflected light reaching them. Window coatings that reduce glare are what we prefer when installing thermal film on windows. A dark headliner will significantly reduce reflection as well. We have found that flat exercise bands (these run about 4″/100 mm wide) make excellent covers for instruments that are throwing too much light. With most of our instruments we can still read the data through the exercise bands. These bands are relatively heavy and stay nicely in place. Whether the windows are wet or dry on the outside, or coated with salt or dirt, the closer you stand to the inside surface the less impact the debris on the windows will have on your vision. Okay: so far we have forward angled windows, a dark headliner, and instruments and/or monitors which are as close to vertical as possible. The next step is lighting up the area forward of the bow. Over the years we have gone from flashlights to powerful 230 V flood lamps, to extreme concentrated LED spot and floodlights. The FPB 78s are fitted with six 10″ rigid LEDs. Three of these are eight-degree wide spots and three are 35-degree driving lights. These are mounted about 20’/6m off the water. They do a reasonable job showing us what is within a few boat lengths. 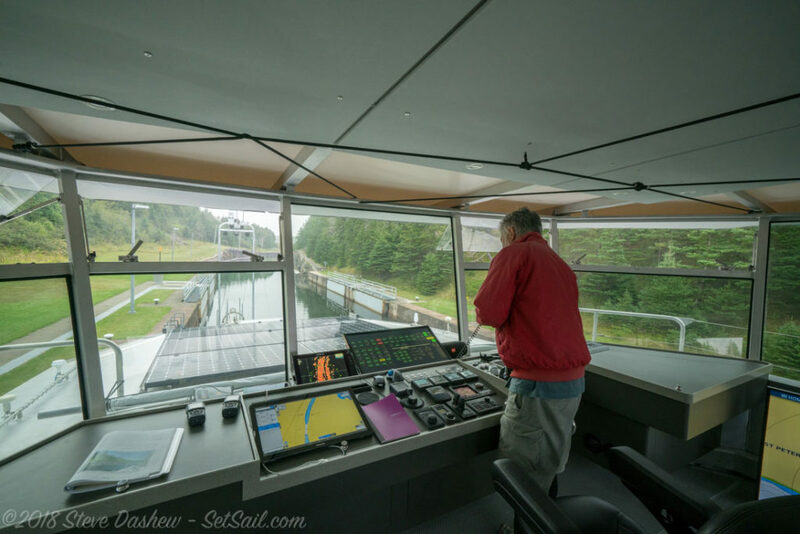 The photo above is taken from the lower helm. The higher you stand, the better you can see forward with the LEDs. However, once you begin to use them, your night vision is essentially shot. For working in temperate climates, say Maine looking for lobster pots, we aim the three spots about a boat length forward and the driving lights three to four boat lengths ahead. If it is ice we are looking for, the order is reversed, with the spots aimed ahead and the wider beams in close. Ice will show up a long way off with the spots. Now let’s switch to the Matrix deck. We would call this desk and instrument layout “conventional”. There is a notch to starboard where we can wedge ourselves in, nose to glass or peering through the open window. A large desk surface on the starboard side provides chart storage and a space to lay charts down. 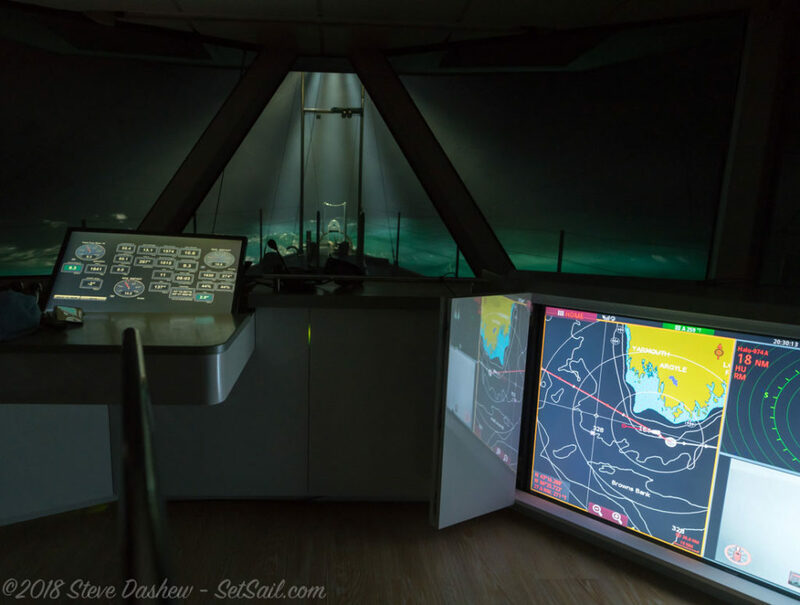 There are two monitors forward, a large TV (55″ on a swing arm to starboard) which can be used with any of the electronics, and an array of controls and instrument faces on the desk just ahead of the center helm chair. The photo above was taken heading into the Bras d’Or lakes in Nova Scotia. 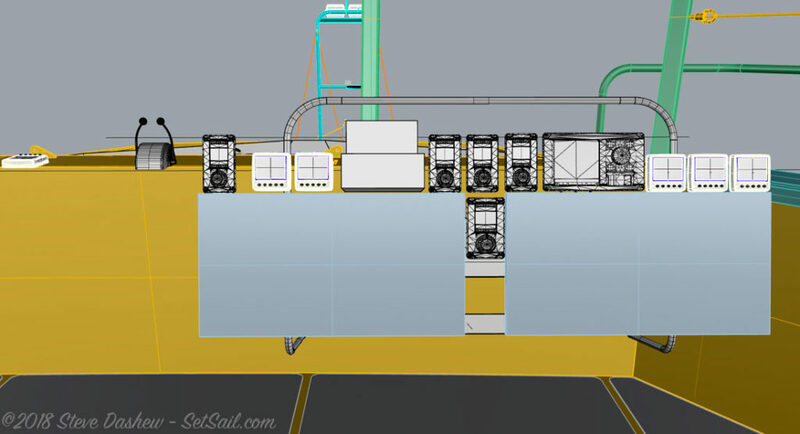 The forward end of the Matrix deck is arranged for two to con the boat under normal circumstances, but it easily adapts to three if we are piloting somewhere difficult. The two watch-standers here are circumnavigators Dr. Michael and Nancy Morrell. They hold the distinction of having completed the slowest circumnavigation of which we are aware – 16 years. Above, Cory McMahon on watch en route from Beaufort, North Carolina towards Long Island Sound. One of Cory’s specialties at his Triton Marine yard is high end sport-fishing navigation packages, and by sport fish standards we have minimal light pollution. In fact, by our usual standards both Matrix and great room helms work well at night. But we have discovered that neither of us sees as well at night as we used to, and the small amount of light pollution that exists with this design is not acceptable at this point in our lives. Since we still prefer to cruise on our own, and don’t want to be dependent on younger crew, we set out to see if we could find a better approach. By abandoning what we had been doing out of habit, and challenging all basic assumptions, we quickly found that the situation could be vastly improved if we took a different approach. We tested different layouts, varied lighting settings, contrast, instrument angles, tried non-reflective overhead panels, and eventually came to the conclusion that the old layout had to go. It simply was not going to get the job done. We gave Corey the go ahead, and within a day his crew at Triton Marine had the Circa-built furniture removed. From here we proceeded to mock up and fine-tune various permutations, all based on a nav package that was mounted at coaming height. The chaotic layout above was actually used to move the boat around Beaufort for a week, in daylight and dark, cruising in open areas and maneuvering in very tight spaces. We gradually refined positioning and design details. Here’s a 3D schematic of where we are going with the new helm design. 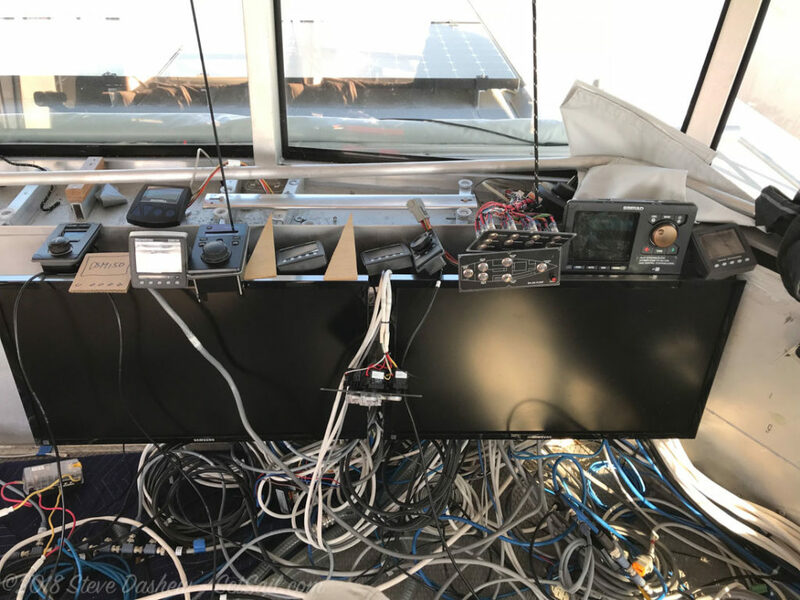 Virtually everything that a watch-stander needs is within reach when seated, including interior and exterior lighting controls, three separate nav system controls, one for each screen (the 55″ TV which will be used for the radar is to port and not shown here). The framework that holds the two 28″ monitors shown above also supports the various controls, instruments, etc. All of this is on a single hinge line, so when night vision is critical the panel will be nearly vertical to eliminate reflection up and then forward. During the day, or twilight hours, the entire panel can be rotated closer to horizontal if desired. The much lower position improves sight lines from both the helm position and further aft. With the helm chair at normal seated height we have better vision than with the extended helm chair previously installed. And as a bonus, the Matrix deck usable deck area has grown substantially, opening up a series of intriguing layout options. We will do a post with the new helm station a few weeks hence, once it is installed. This entry was posted on Thursday, February 8th, 2018 at 1:58 pm and is filed under Dashew Logs, FPB 78, The Logs. Both comments and pings are currently closed. You don’t mention it, but your FLIR camera (apart from being a single point of failure) doesn’t make a significant contribution? Separately, I think you mentioned in the past that your Samsung monitors dim sufficiently to be usable, but your TV looks quite bright in the second photo? It has taken us a while to get reasonable performance from the FLIR night vision camera. 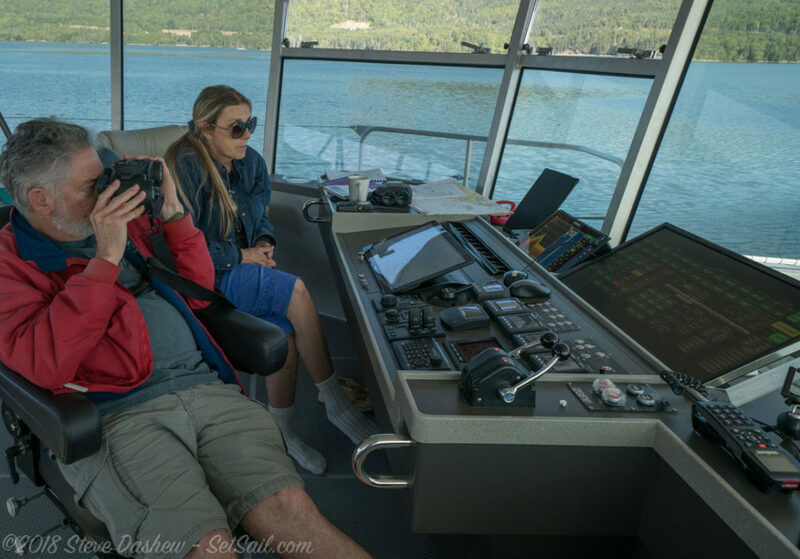 We found that there are a variety of adjustments that can be made from the Simrad system, with which the FLIR camera is integrated. These adjustments give us a much better picture. That said, we are still most comfortable looking directly outside to maintain our situational awareness. The largest screen is a standard TV. The two smaller units (28″) are 4K monitors. Some Samsung models have a menu item which optimizes them for side, seated, or standing viewing angles. Our two smaller units have this feature and it works well. Being 71 now, i truly from experience, if only re “driving at night” on land, appreciate your having to address “the night-vision matters”. The hinged-panel with the minimum-needed — a day-setup and a night-setup — “simple” is always best, isn’t it. And … with your cruising-plans beginning in March, in addition to all the “transitioning back to cruising” work-/attention-demands, plus with your now having some space to “just-relax” now that the fpb-program is closed (save the two remaining-70s), i can easily appreciate the internal and external demands for your “time/attention” being near-onerous — yes…? So, it is with a heartfelt understandingly-compassionate awareness of the-above, that i’m wondering how to — kindly, graciously, respectfully, albeit with some-trepidation — shape a gentle-asking re some minimal news-about and, maybe even, some external and internal pics-of, the current progress-stage of 701 and 702 …. … possibly thru Sarah, if it’s not inconvenient for her to assist …. Steve, I love the idea of challenging your basic assumptions and embracing needed changes. What navigation software have you settled on and what monitors and computers have you selected? As I enter my 70’s, I too find my night vision to be less effective. I find myself hunting down those extraneous “I’m on” lights with electrical tape to cover them, obviously a very short term solution. As always, thanks for another helpful piece. Re electronics, this is the first time we have used an integrated system from a single vendor, in this case Simrad. In the past we have always picked the best of each and used them stand-alone. We would go back to that approach if we had this to do all over. The theoretical benefits are not worth the tradeoffs. The main reason for us to use the integrated approach was so that we could display any of the data on any monitor. However, doing this required several extra key strokes or button pushes to change from one window to another and we find that things are happening quickly the extra steps can be distracting, or done improperly lead to loss of situational awareness. In the Mark ll Matrix layout we opted for three”monitors”, each with its own dedicated CPU and controller. Tow of these outputs are available from the normal Simrad black box, and the third is the output from the stand-alone seven inch Simrad nav module. For display we have three Samsung monitors. Two of these are 28″ on the diagonal and the third is 50″. 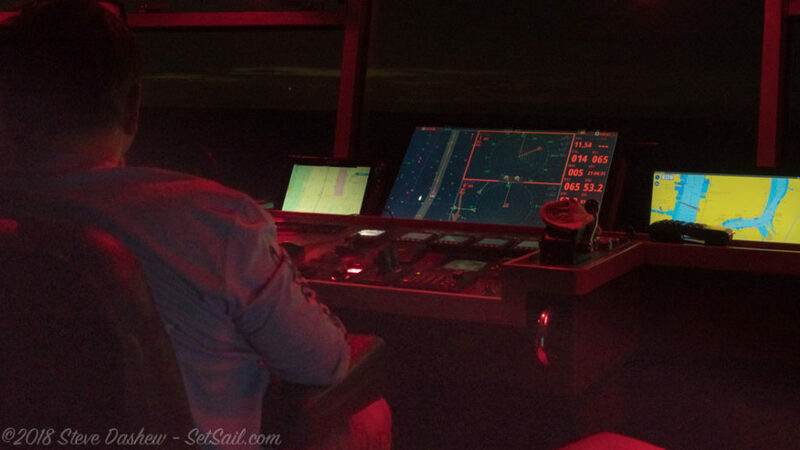 The big monitor is dedicated to radar, while the two smaller monitors are used for navigation and depth/sonar. A key element in our approach is the use of the 18.5″ Samsung Galaxy tablets. These are connected by wifi to the boat’s system and have their own charting programs plus GPS. We run the Maretron N2K display on one of the tablets and a back up charting program on the other tablet. The monitors work OK in bright light – of course they are completely shade which helps – and dim sufficiently in the dark (this requires dimming and adjusting contrast. Did you ever test some of Sony Pro monitors like BVMX300/2? Price is very high, but possibilities for control of picture are extremely wide. Must exist some hoods for this monitors to reduce reflection. That is some monitor spec! And at US$40,000 it should be. However, for our needs there are lots of options in the US$550. range. Steve do you or other FPB owners us auxiliary Infrared LED light bars to supplement your night vision cameras? Negative on infrared LED light bars.Would love to have some more input on this from anyone with experience using these. feeling like my internet has crashed, starving for more updates. We have not had any feedback as to how well this doppler affect software performs . We will probably give it a try and report back.